Laser Hair Therapy is a non-surgical, scientific approach in the cosmetic treatment of hair loss, thinning hair, and scalp problems. 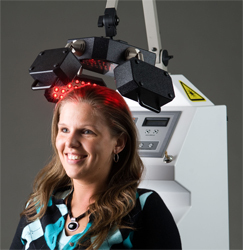 Laser Hair therapy has been tested and is perfectly safe and effective. 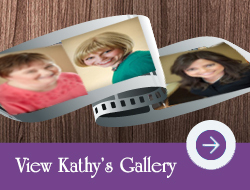 Kathy Pope has helped hundreds of women combat hair loss. Through doctor-directed programs combining low level laser technology, combined with patented formula hair products and nutritionals, women have experienced continued hair growth successfully. Laser Technology really works! Call Kathy Pope today to find the right treatment program for your specific hair loss needs. Treat your hair loss from your own home with the first FDA OTC cleared, wearable laser treatment. The Theradome™ has more diodes than any other helmet and provides clinical strength laser technology for safe, effective hair restoration at home. The hands-free operation allows the user to move about freely during treatments. This treatment option is perfect for someone with a hectic schedule or someone who can’t make it into a clinic for weekly treatments. Theradome™ uses specially developed, high efficiency lasers that deliver the maximum amount of light and cover 582 cm2 of the 720 cm2 total scalp area in the average human head. The Theradome™ is also cleared to increase the diameter of the hair you currently have by up to 200%. This is a major development in the treatment of hair loss and unique to this device. Increases blood flow to the scalp and hair follicles. Stimulates microcirculation, improves cellular metabolism and protein synthesis. Reduces the effects of protein blocking enzymes, promoting thickness and density. HairMax® LaserComb delivers gentle, nourishing laser light to your hair follicles which stimulates energy production and creates a healthier environment for hair growth. This boost in laser energy stimulates hair growth by increasing cellular energy through enhanced ATP production, increases blood flow to the follicle, brings in more oxygen and nutrients, activates antioxidant defenses and speeds up the elimination of waste products such DHT. HairMax laser light treatments help restore your hair’s natural hair growth cycle resulting, in new hair growth with increased density, fullness and vibrancy. 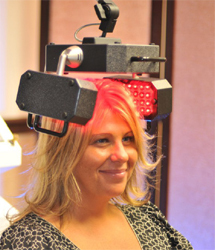 The Capillus272™ Laser Cap is a low-level light therapy device that fits securely on your head, under the cap or hat of your choice. We’re all busy. Capillus272™ was designed so you only need 30 minutes per treatment, three times a week. Getting your hair back is a convenient and affordable process. Powered by a battery pack that clips to any belt or pant waist, the Capillus272™ allows the user the mobility to go about their normal activities during use. It features 272 lasers at low power wattage of 5mW and wavelength of 650 nm. The cap has a deeper fit than other less powerful caps on the market, providing more coverage to the temple area. The Capillus272™ has been featured on The Rachel Ray Show, The View, Dateline, Today, and other media outlets. The device’s mobility and the opportunity to easily conceal inside of a hat or scarf makes this a popular home treatment choice. There are many options available for managing hair loss. Our certified hair loss consultants can assist you in finding the right laser treatment based on your individual needs. HairMax has been proven safe and effective in 7 clinical studies with a total of 460 participants and is the only laser hair loss device with clinical studies published in 5 medical peer reviewed journals. Participants experienced significant hair growth with an average increase in hair count of 129 additional hairs per square inch. HairMax has collaborated with the leading Italian design firm Pininfarina, to create a refined and distinctive iconic design for the newest range of HairMax Laser devices. Combining form with function, technology with innovation, the HairMax-Pininfarina line of laser hair growth devices are exquisitely designed and unequaled in style, usability and most importantly, effectiveness. Genetic predisposition of hormonal levels as well as the conversion of testosterone into Dihydrotestosterone (DHT) can be inherited from either your mother’s or your father’s side of the family. Acne is the inflammation of the sebaceous glands from retained secretion and is associated with hormone byproducts. Acne is an indication of hormonal imbalances that often lead to premature hair loss. Seborrhea is functional disease of the sebaceous glands that produces excess sebum, which builds up on the scalp. An over production of sebum is a warning sign indicating the same hormonal imbalances that lead to hair loss. Alopecia areata is a systemic, non-hormonal cause of hair loss triggered by genetics, diet and stress and is characterized as bald spots that inadvertently come and go and can include permanent hair loss. Excessive daily hair loss is when 50 or more hairs per day are lost and not replaced at the same rate, indicating potential hair loss problems. Excessive or sudden appearance of body hair in women can indicate an imbalance in hormones. This same hormonal imbalance can cause premature hair loss. Stress and trauma are prone to produce increased levels of testosterone, which converts to DHT, and interrupts the hair growth cycle. Nutrition and diet play a significant role in hair loss whereby a high consumption of animal fats, rapid weight loss and liquid protein diets can create a lack of amino acids, biotin, iron, protein and zinc – all of which are essential to healthy hair. Health issues such as malfunctioning of the hormone producing thyroid and natural hormonal changes in women due to pregnancy, childbirth and menopause, can trigger hair loss. Medications such as birth-control or any hormone therapy can contribute to hair loss as the hair follicle is incredibly sensitive to changes. Steroids, specific chemotherapies as well as many blood pressure, diabetic, heart disease and acne medications can cause temporary or permanent hair loss.